فدوی, فرشته, عبدالخانی, علی, همزه, یحیی, هتگر, هوبرت, روزنااو, توماس. (1395). روشی جدید برای اصلاح سلولز در محیط آبی با استفاده از شیمی آلکوکسی سیلان. مجله صنایع چوب و کاغذ ایران, 7(3), 463-474. فرشته فدوی; علی عبدالخانی; یحیی همزه; هوبرت هتگر; توماس روزنااو. "روشی جدید برای اصلاح سلولز در محیط آبی با استفاده از شیمی آلکوکسی سیلان". مجله صنایع چوب و کاغذ ایران, 7, 3, 1395, 463-474. فدوی, فرشته, عبدالخانی, علی, همزه, یحیی, هتگر, هوبرت, روزنااو, توماس. (1395). 'روشی جدید برای اصلاح سلولز در محیط آبی با استفاده از شیمی آلکوکسی سیلان', مجله صنایع چوب و کاغذ ایران, 7(3), pp. 463-474. فدوی, فرشته, عبدالخانی, علی, همزه, یحیی, هتگر, هوبرت, روزنااو, توماس. روشی جدید برای اصلاح سلولز در محیط آبی با استفاده از شیمی آلکوکسی سیلان. مجله صنایع چوب و کاغذ ایران, 1395; 7(3): 463-474. اصلاح سطح پلیمر سلولز در زمینه شیمی ترکیبات تجدیدپذیر دارای نقشی بسیار مهم و اساسی می‌باشد. 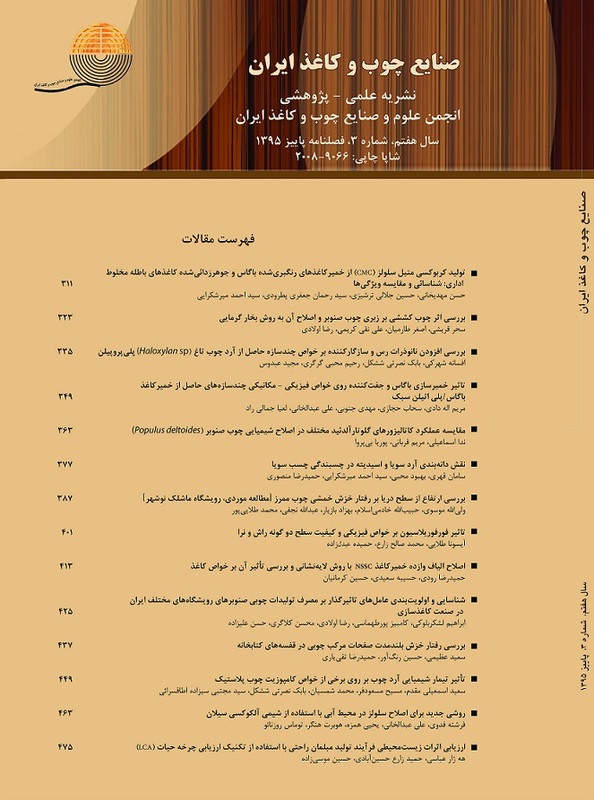 در این تحقیق، میکروکریستالین سلولز (آویسل) با استفاده از یک ترکیب آلکوکسی سیلان تحت شرایط ملایم، در دمای محیط، در آب و با استفاده از مقادیر کاتالیزوری هیدروکسید سدیم تحت تیمار قرار گرفت. (3-مرکپتوپروپیل)-تری متوکسی سیلان در سه غلظت µmol/mL 1614، 1074، 535 (به ترتیب معادل با µL 300، 200، 100 سیلان) بر روی سلولز پیوندزنی شد و ساختار سلولز اصلاح شده با استفاده از طیف‌سنجی FTIR، 13C NMR و 29Si NMR جامد مورد تجزیه و تحلیل قرار گرفت. افزایش غلظت آلکوکسی سیلان از µmol/mL 535 به µmol/mL 1074 سبب افزایش میزان تشکیل پل‌های سیلوکسان بین مولکول‌های سیلان با کربن‌های سلولز شده است در حالیکه با افزایش سیلان به مقدار بیشتر و از‌ µmol/mL 1074 به µmol/mL 1614، نسبت میزان پل‌های سیلوکسان تشکیل شده بین مولکول‌های سیلان با یکدیگر در مقایسه با نسبت این پل‌ها با اتم‌های کربن سلولز، افزایش یافت، به نحوی که درصد آن از 34 درصد در میزان سیلان µL 200 به 66 درصد در میزان سیلان µL 300 افزایش یافت. Thakur, M.K., Gupta, R.K. and Thakur, V.K., 2014. Surface modification of cellulose using silane coupling agent. Carbohydrate polymers, 111: 849-55. Wang, P., Meng, J., Xu, M., Yuan, T., Yang, N., Sun, T., Zhang, Y., Feng, X. and Cheng, B., 2015. A simple but efficient zwitterionization method towards cellulose membrane with superior antifouling property and biocompatibility. Journal of Membrane Science, 492: 547-58. Tee, Y.B., Talib, R.A., Abdan, K., Chin, N.L., Basha, R.K. and Yunos, K.F.M., 2013. Thermally grafting aminosilane onto kenaf-derived cellulose and its influence on the thermal properties of poly (lactic acid) composites. BioResources, 8:4468-83. Hafrén, J., Zou, W. and Córdova, A., 2006. Heterogeneous ‘organoclick’derivatization of polysaccharides. Macromolecular rapid communications, 27:1362-6. Liebert, T., Hänsch, C. and Heinze, T., 2006. Click chemistry with polysaccharides. Macromolecular rapid communications, 27:208-13. Pahimanolis, N., Hippi, U., Johansson, L-S., Saarinen, T., Houbenov, N., Ruokolainen, J., Houbenov, N., Ruokolainen, J. and Seppälä, J., 2011. Surface functionalization of nanofibrillated cellulose using click-chemistry approach in aqueous media. Cellulose, 18:1201-1211. Lahann, J., 2009. Click chemistry for biotechnology and materials science: Wiley Online Library. Elchinger, P-H, Montplaisir, D. and Zerrouki, R., 2012. Starch–cellulose crosslinking—Towards a new material. Carbohydrate Polymers, 87:1886-90. Heinze, T., Schöbitz, M., Pohl, M. and Meister, F., 2008. Interactions of ionic liquids with polysaccharides. IV. Dendronization of 6‐azido‐6‐deoxy cellulose. Journal of Polymer Science Part A: Polymer Chemistry, 46:3853-9. Koschella, A., Richter, M. and Heinze, T., 2010. Novel cellulose-based polyelectrolytes synthesized via the click reaction. Carbohydrate research, 345:1028-33. Krouit, M., Bras, J. and Belgacem, M.N., 2008. Cellulose surface grafting with polycaprolactone by heterogeneous click-chemistry. European Polymer Journal, 44:4074-81. Pierre-Antoine, F., François, B. and Rachida, Z., 2012. Crosslinked cellulose developed by CuAAC, a route to new materials. Carbohydrate research, 356:247-51. Pohl, M. and Heinze, T., 2008. Novel Biopolymer Structures Synthesized by Dendronization of 6‐Deoxy‐6‐aminopropargyl cellulose. Macromolecular Rapid Communications, 29:1739-45. Ritter, H., Knudsen, B., Mondrzik, B.E., Branscheid, R. and Kolb, U., 2012. Cellulose‐click‐ferrocenes as docking spots for cyclodextrin. Polymer International, 61:1245-8. Zhang, J., Xu, X-D., Wu, D-Q., Zhang, X-Z. and Zhuo, R-X., 2009. Synthesis of thermosensitive P (NIPAAm-co-HEMA)/cellulose hydrogels via “click” chemistry. Carbohydrate polymers, 77:583-9. Hettegger, H., Gorfer, M., Sortino, S., Fraix, A., Bandian, D., Rohrer, C., Harreither, W., Pothast, A. and Rosenau, T., 2015. Synthesis, characterization and photo-bactericidal activity of silanized xanthene-modified bacterial cellulose membranes. Cellulose, 22:3291-304. Hettegger, H., Sumerskii, I., Sortino, S., Potthast, A. and Rosenau, T., 2015. Silane meets click chemistry: towards the functionalization of wet bacterial cellulose sheets. ChemSusChem, 8:680-7. Feese, E., Sadeghifar, H. and Gracz, H.S., Argyropoulos, D.S. and Ghiladi, R.A., 2011. Photobactericidal porphyrin-cellulose nanocrystals: synthesis, characterization, and antimicrobial properties. Biomacromolecules, 12:3528-39. Huang, J-L., Li, C-J. and Gray, D.G., 2014. Functionalization of cellulose nanocrystal films via “thiol–ene” click reaction. RSC Advances, 4:6965-9. Tingaut, P., Hauert, R. and Zimmermann, T., 2011. Highly efficient and straightforward functionalization of cellulose films with thiol-ene click chemistry. Journal of Materials Chemistry 21:16066-76. Yuan, T., Meng, J., Gong, X., Zhang, Y. and Xu, M., 2013. Modulating pore size and surface properties of cellulose microporous membrane via thio-ene chemistry. Desalination, 328: 58-66. Meng, X. and Edgar, K.J., 2015. “Click” reactions in polysaccharide modification. Progress in Polymer Science. Hettegger, H., Beaumont, M., Potthast, A. and Rosenau, T., 2016. Aqueous Modification of Nano‐and Microfibrillar Cellulose with a Click Synthon. ChemSusChem, 9:75-9. Wang, J., Zhao, B., Zhao, L., Zhang, X. and Zhao, D., 2015. Preparation, characterization and application of a novel silane-bridged polyaniline/cotton fiber composite. Synthetic Metals, 204:10-6. Henniges, U., Vejdovszky, P., Siller, M., Jeong, M-J., Rosenau, T., and Potthast, A., 2011. Finally Dissolved! Activation Procedures to Dissolve Cellulose in DMAc/LiCl Prior to Size Exclusion Chromatography Analysis–A Review. Curr Chromatogr, 1:52-68. Salon, M.C.B., Gerbaud, G., Abdelmouleh, M., Bruzzese, C., Boufi, S. and Belgacem, M.N., 2007. Studies of interactions between silane coupling agents and cellulose fibers with liquid and solid‐state NMR. Magnetic Resonance in Chemistry, 45:473-83. Fernandes, S.C., Sadocco, P., Alonso-Varona, A., Palomares, T., Eceiza, A., Silvestre, A.J., Mondragon, I. and Freire, C.S.R., 2013. Bioinspired antimicrobial and biocompatible bacterial cellulose membranes obtained by surface functionalization with aminoalkyl groups. ACS applied materials & interfaces, 5:3290-7.